Fig. 1. Chéron and Gaultier, Typus, 1622. Engraving on paper, 29.1 x 18.5 in. (74 x 47 cm). Rare Book Division, Department of Rare Books and Special Collections, Princeton University Library. 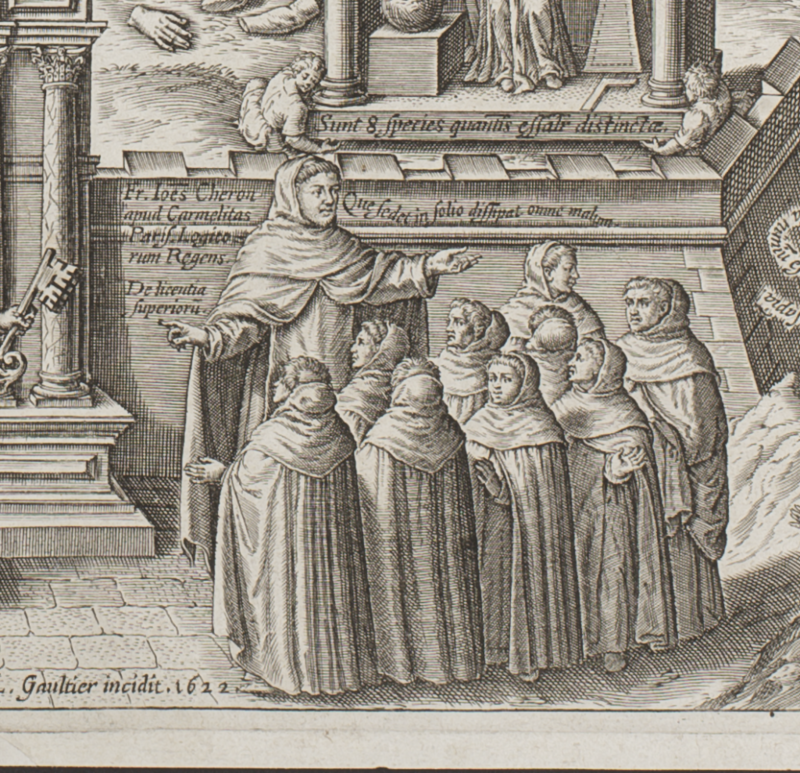 In 1622 the Carmelite professor of logic Jean Chéron (1596–1673) designed an engraving, titled Scheme of the Necessity of Logic for Grasping the Other Branches of Knowledge (Typus necessitatis logicae ad alias scientias capessendas), hereafter Typus, that depicts the human quest to reach wisdom (Fig. 1, above). Throughout this broadside, nearly a hundred small figures stumble along treacherous pathways, scale craggy cliffs, cross wild hunting grounds, and sail through a roiling sea in pursuit of wisdom, represented by a domed temple rising above the waters near top of the page. 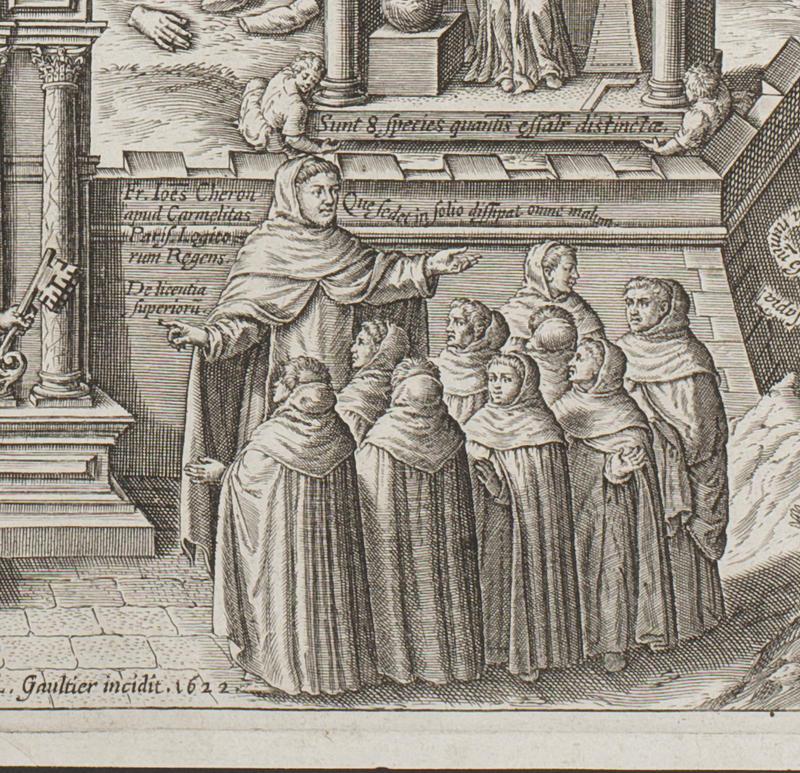 At the bottom of the scene, Chéron himself stands in his Carmelite habit, surrounded by his students (Fig. 2). Fig. 2. Chéron and Gaultier, detail showing Chéron and his students from the Typus, 1622. Rare Book Division, Department of Rare Books and Special Collections, Princeton University Library. 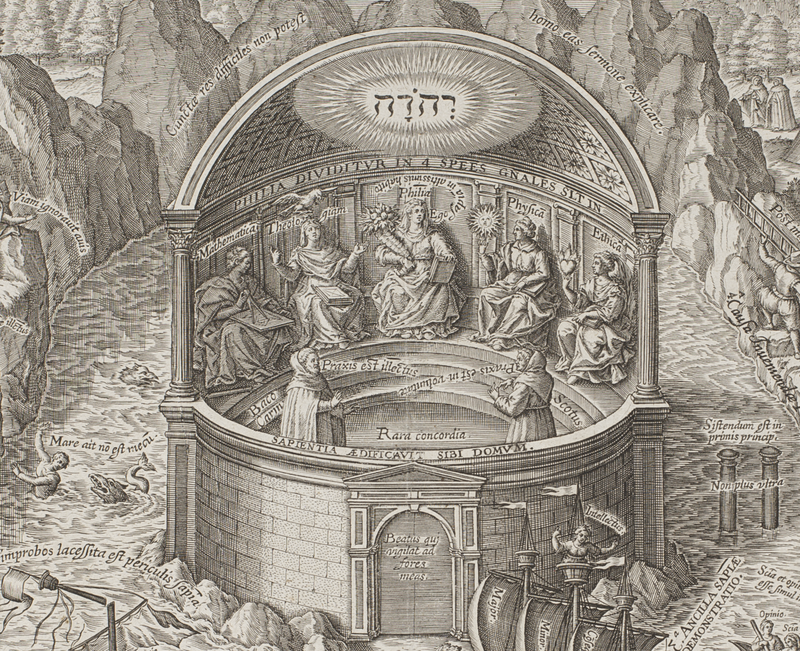 He gestures toward the gates of this landscape, which are guarded by Logic, and invites his students to embark on the journey through this portal, because, he advises them, a mastery of logic is needed for the discovery of wisdom (Fig. 3). Fig. 3. 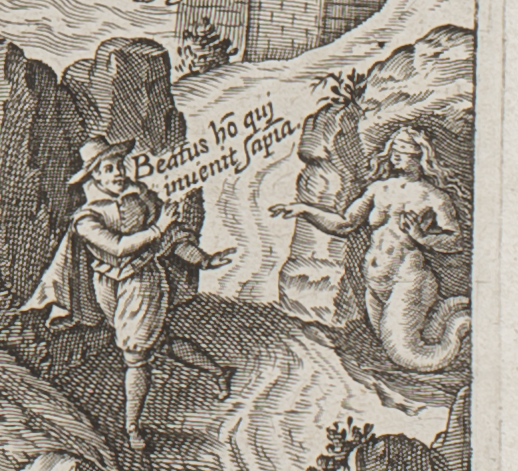 Detail showing Logic from the Typus, 1622. Rare Book Division, Department of Rare Books and Special Collections, Princeton University Library. For Chéron’s students at his Carmelite monastery in Paris, this detailed chorographic map depicted the fictional region they would have to cross through as they followed the road of intellectual discovery in pursuit of knowledge. The smaller images within this realm are juxtaposed with fragments of biblical and philosophical texts to depict and to interpret the tools students required in their attempt to master logic and thus to find wisdom. 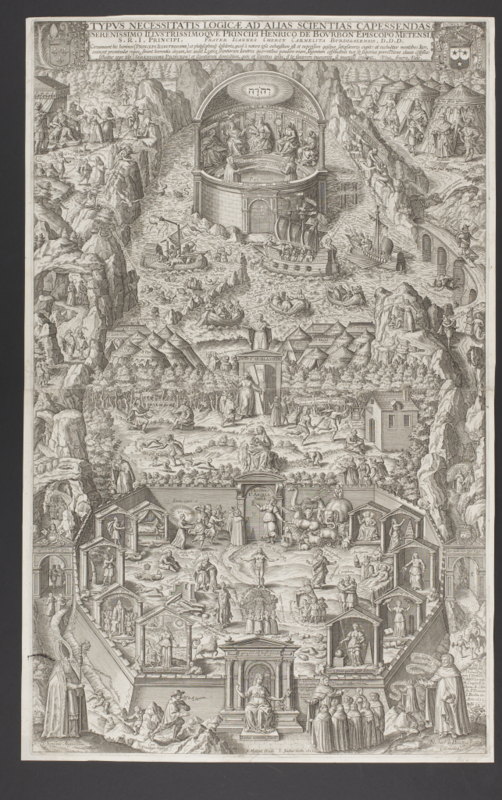 Produced in collaboration with the engraver Léonard Gaultier (1560/61–1635) and published by Jean Messager (1572–1649), the document was employed by Chéron and his students as a thesis print, a genre of broadside that featured the theses or propositions to be discussed at oral examinations called disputations. The Typus and a collection of other wonderfully intricate philosophical broadsides are at the center of my book, The Art of Philosophy: Visual Thinking in Europe from the Late Renaissance to the Early Enlightenment. I show how their inventive iconography inspired new visualizations of thought in a range of drawn and printed sources, including student lecture notebooks, printed books, and alba amicorum (friendship albums). 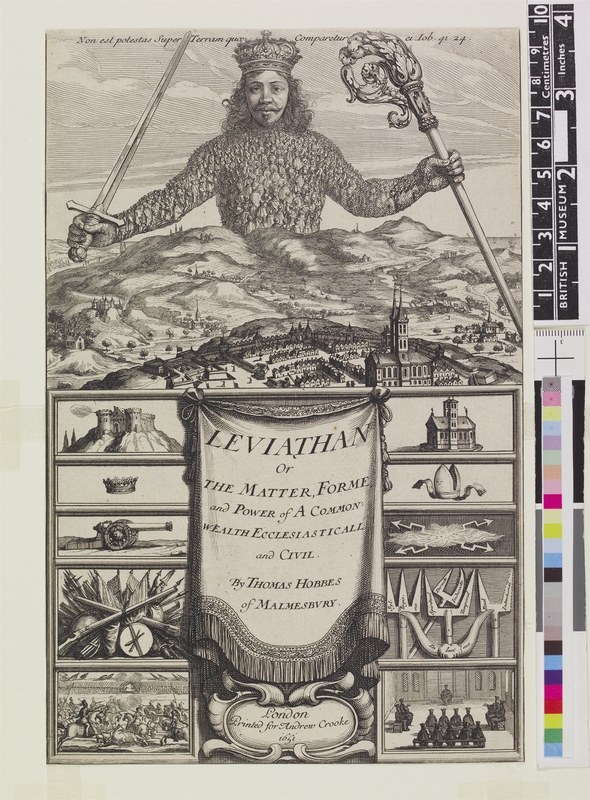 The book culminates with a new study of the celebrated frontispiece to Hobbes’s Leviathan (Fig. 4). I argue that previous accounts of the print have failed to capture the full complexity of this etching and offer a new, if complex, account of this famous image—one which emphasizes the process of the state’s generation. Artists and philosophers invested significant amounts of time and money in the creation of philosophical visual representations and we must take these contributions to their thought seriously if we wish to understand their ideas in all their complexity and richness. Fig. 4. Bosse and Hobbes, frontispiece to Leviathan (London: Andrew Crooke, 1651). Etching on paper, 9.5 (trimmed) x 6.1 in. (24.1 x 15.5 cm). British Museum, London. 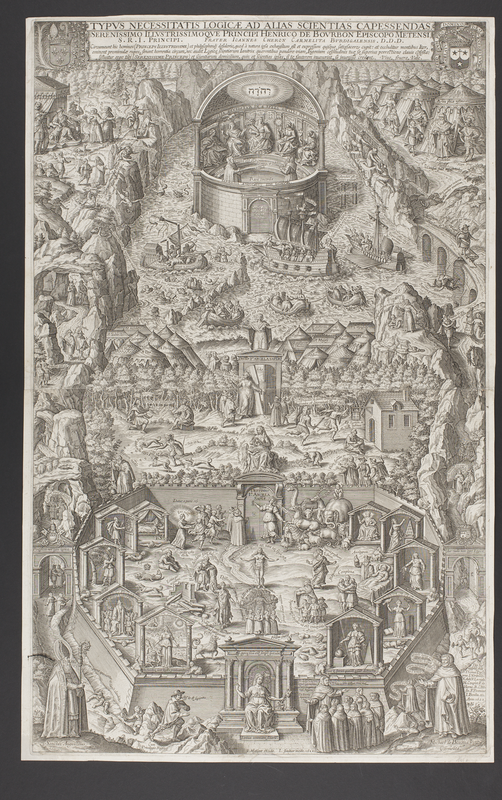 In representing the field of logic through a map of diverse terrains, the Typus offers both a visual commentary on the tenets of Aristotelian scholastic philosophy as they were taught in early modern France, and an allegorical depiction of the strenuous intellectual process of the search for understanding, as well as the perils of laziness and the incorrect applications of philosophy. 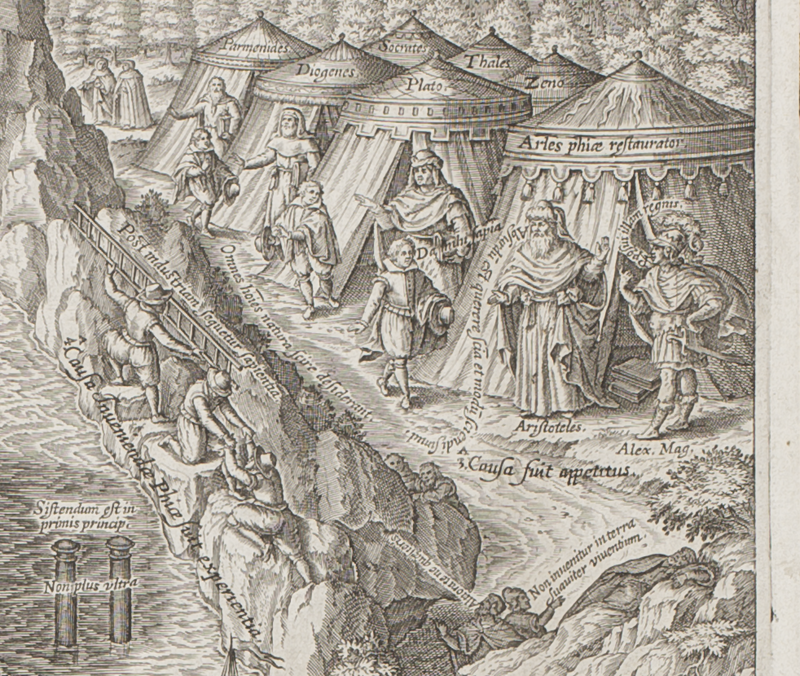 The print unequivocally promotes the philosophy of Aristotle, who stands at the top of the pathway on the right before a military tent that is inscribed, “Aristotle restorer of philosophy” (Aristoteles philosophiae restaurator) (Fig. 5). Fig. 5. Detail showing Aristotle from the Typus, 1622. Rare Book Division, Department of Rare Books and Special Collections, Princeton University Library. 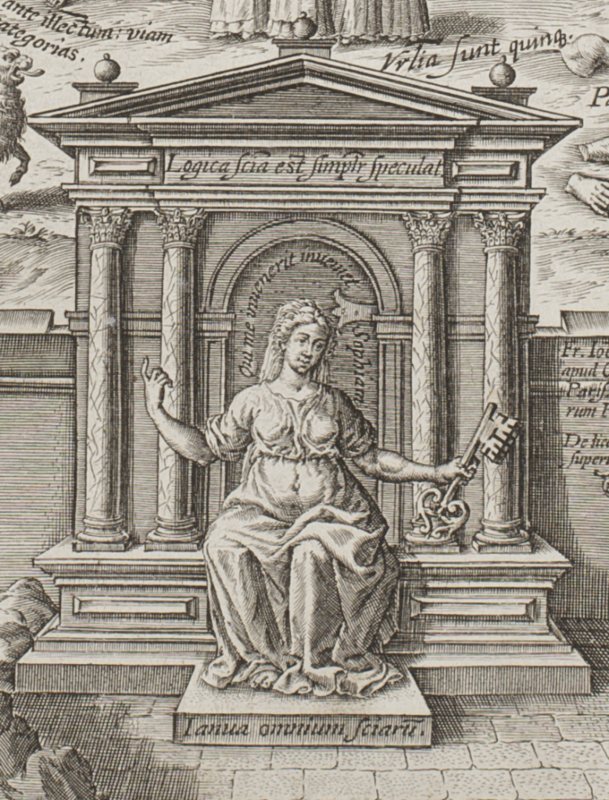 Logic instruction in early seventeenth-century Paris was based primarily on the compendium of Aristotle’s texts called the Organon and the philosopher Porphyry’s treatise known as the Isagoge. This material was organised according to three principle intellectual processes known as the operations of the mind. The Typus is similarly arranged in three main sections that correspond to these operations. Through apprehension, the first operation of the mind, the conception of an object or term is brought to the mind. It is through judgment, the second operation of the mind, that simple concepts are divided or combined to form propositions. By way of the third operation, the mind organizes the propositions to produce syllogisms or arguments. So, for instance, the first operation of the mind could apprehend the concepts of “Chéron” and of “Carmelite,” and then the second operation could combine those two concepts into the proposition “Chéron is a Carmelite,” and then finally the third operation of the mind could combine this proposition with another to produce the following syllogism: Chéron is a Carmelite/ All Carmelites are Catholic/ Therefore, Chéron is a Catholic. To clarify this analysis I have divided the image into numbered segments (Fig. 6). Fig. 6. The six segments of the Typus, 1622. Rare Book Division, Department of Rare Books and Special Collections, Princeton University Library. The viewer was expected to begin contemplating the broadside in segment one by reading its title and then its dedication to Henri de Bourbon (1601–1682), the illegitimate son of Henri IV. The figures descending the pathways in segment two head towards the gate guarded by Logic. These pathways act as a framing device that directs the spectator’s gaze from the top of the broadside to the entrance to the courtyard at the bottom. The figures on the pathways remind students of the importance of learning Aristotelian logic. For instance, a little below Aristotle, two men stand beside a third who sleeps on a rock (Fig. 7). Fig. 7. 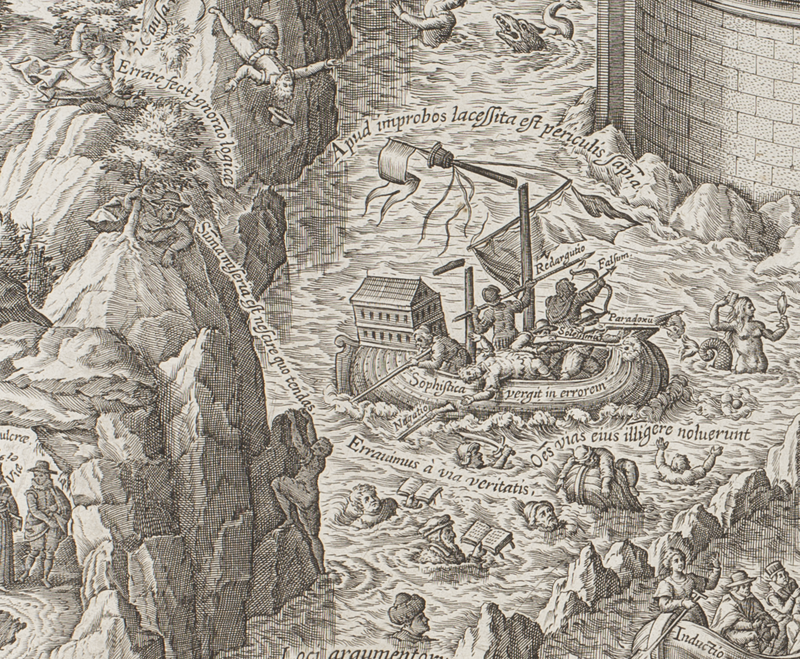 Detail on the dangers of laziness from the Typus, 1622. Rare Book Division, Department of Rare Books and Special Collections, Princeton University Library. The figure nearest the sleeping man says, “It [i.e. wisdom] is not found in the land of them that live in delights.” (Non invenitur in terra suaviter viventium.) 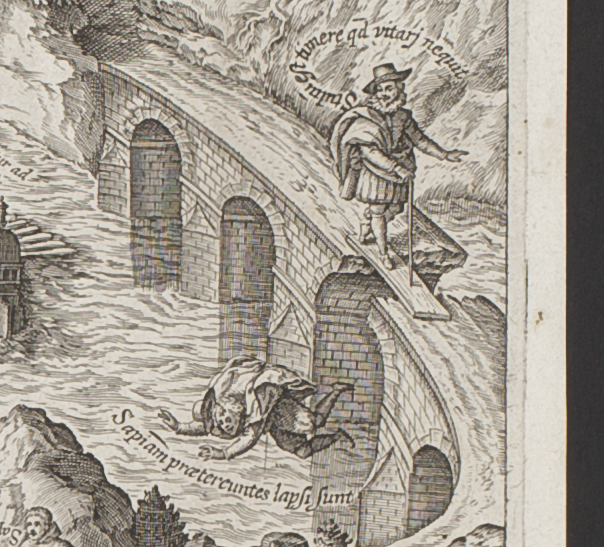 Further down the pathway, a man falls off a bridge into the water (Fig. 8). Fig. 8. Detail on the dangers of disregarding wisdom from the Typus, 1622. Rare Book Division, Department of Rare Books and Special Collections, Princeton University Library. Near the falling man Chéron includes an annotation explaining the cause of his demise: “For regarding not wisdom, they have slipped” (Sapientiam praetereuntes lapsi sunt). In these images, Chéron admonishes his students to remain actively engaged in their studies and not to act foolishly or lazily. Chéron also warns his students about the dangers of distractions of the flesh. Below a man runs from a blindfolded siren, declaring, “Blessed is the man that findeth wisdom” (Beatus homo qui invenit sapientiam) (Fig. 9). Fig. 9. Detail on the dangers of distractions of the flesh from the Typus, 1622. Rare Book Division, Department of Rare Books and Special Collections, Princeton University Library. Those scholars who have not yet fallen asleep, lost their footing, or given into temptation along their journey will pass through the gates of Logic, where they enter what we can identify as the third segment of the broadside, a courtyard that illustrates the first operation of the mind. Inside ten porticoes along the inner walls of the enclosure, Chéron stages scenes interpreting the meanings of each of Aristotle’s ten categories, which are the different types of concepts apprehended through the first operation of the mind. For instance, the category of “being affected” (Passio) is represented by a woman whose arm has been severed (Fig. 10). Fig. 10. Detail on the category of “being affected” from the Typus, 1622. Rare Book Division, Department of Rare Books and Special Collections, Princeton University Library. Having made their way through this courtyard, the studious scholar reaches segment four, a valley that encapsulates the workings of the second operation of the mind. A woman, boy, and girl at the bottom center of the field illustrate how the intellect obtains, processes, and organizes sensory data (Fig. 11). Fig. 11. Detail on how the intellect obtains, processes, and organizes sensory data from the Typus, 1622. Rare Book Division, Department of Rare Books and Special Collections, Princeton University Library. Scholastic Aristotelian philosophers held that the intellect does not receive information from the five external senses directly. Once the senses have gathered information from the outside world, it must be processed or apprehended, through the first operation of the mind, before it can be divided and combined into propositions, through the second operation of the mind. A woman, boy, and girl at the center of the field show this process. The young boy personifies the five external Senses; he picks flowers, beside the words, “The senses collect” (Sensus colligit). The flowers symbolize things that humans become aware of through the senses. The naked young girl, who stands at the knee of the seated woman, is identified as Apprehension with the words, “Apprehension acts as assistant” (Ap[p]rehensio ministrat.). Apprehension “assists” with processing sensory information. The seated woman personifies the Second Operation of the mind. 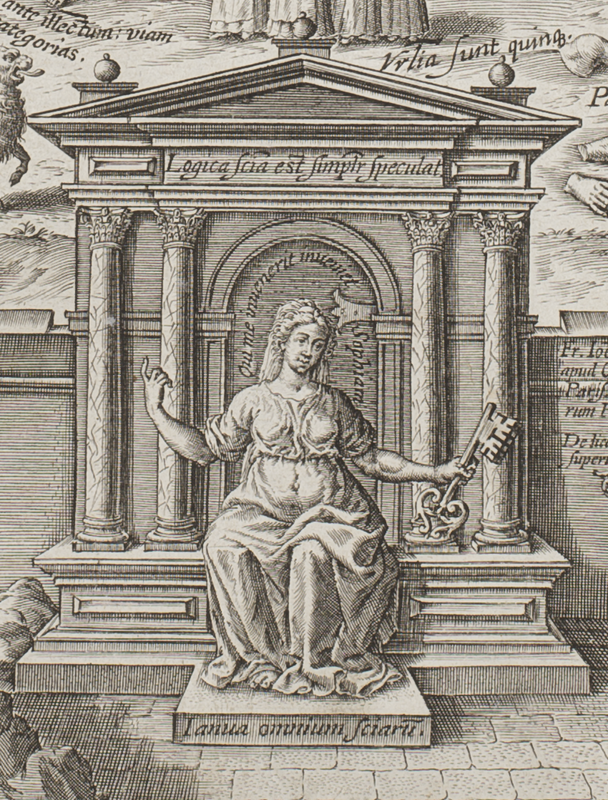 Above her is the inscription, “The second operation binds simple terms” (2A operatio simplices nectit terminos.) The boy gives his flowers to Apprehension, who in turn hands them over to the Second Operation, who binds the flowers together to create a wreath, a metaphor for the combining of concepts into propositions. Beyond this valley, in the fifth segment of the broadside, is an interpretation of the third operation of the mind, or the mind’s ability to combine propositions into syllogisms, depicted across a seascape that incorporates imagery of seafaring and military battle. Chéron and Gaultier show a female with three faces who personifies the three kinds of Syllogism (Fig. 12): syllogisms that result in knowledge, opinions, and errors. The syllogisms that result in knowledge are summarized on a galleon, a large multi-decked sailing ship that could withstand a major ocean crossing. Fig. 12. 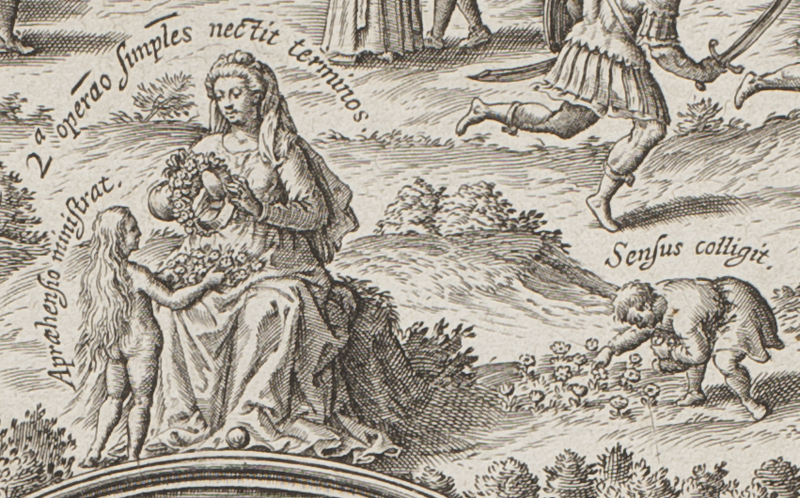 Detail showing the personification of the three kinds of Syllogism from the Typus, 1622. Rare Book Division, Department of Rare Books and Special Collections, Princeton University Library. Sophistic methods of argumentation are represented by the sailboat furthest to the left (Fig. 13). Fig. 13. Detail on sophistic methods of argumentation from the Typus, 1622. Rare Book Division, Department of Rare Books and Special Collections, Princeton University Library. 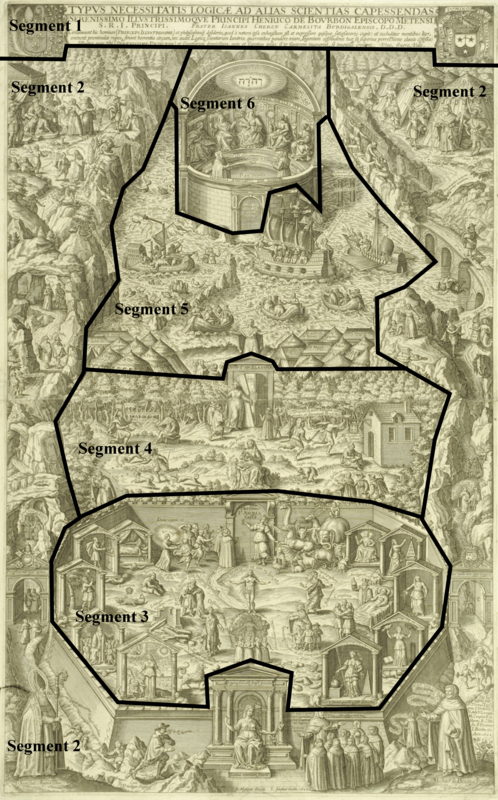 Those who survive the waters travel onwards to the edifice in segment six (Fig. 14). Fig. 14. 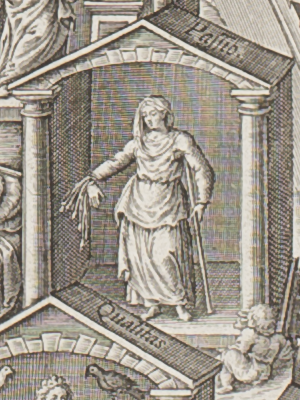 Detail showing the home of Wisdom from the Typus, 1622. Rare Book Division, Department of Rare Books and Special Collections, Princeton University Library. This building, shown in cross-section to reveal its interior, is marked as the home of Wisdom. In the front of the temple, two monks debate whether voluntary action is an act of the will or the intellect. Five women, seated in a row, observe the debate. In the center sits Philosophy, holding a book and a cornucopia of flowers. 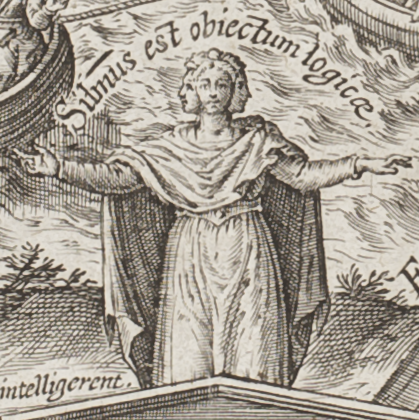 The text near her mouth stresses both her positioning at the top of the Typus and her close ties to wisdom: “I inhabit wisdom in the highest places” (Ego sap[ient]iam in altissimis habito). The wall above Philosophy and her companions bears the words, “Philosophy is divided into four general species, namely into” (PHILOSOPHIA DIVIDITVR IN 4 SPECIES GENERALES SCILICET IN) introducing the disciplines personified to Philosophy’s left and right. The left-most figure is Mathematics, who draws on a tablet with a compass. Next to Mathematics sits Theology with a book—almost certainly the Bible—in her lap and a dove above her that symbolizes inspiration. Theology points upwards to refer to the dove and higher powers. To the right of Philosophy is Physics with an opened book on her lap, holding a sun with a face in her right hand. The right-most woman personifies Ethics; she holds a burning heart and has a book resting on her lap. With this representation of the home of wisdom Chéron places great emphasis on the value of studying logic in order to gain wisdom in other disciplines. Chéron and Gaultier’s strict pedagogical perspective is confirmed by a detail in the upper right region of the broadside, where the words “Non plus ultra” (or “Nothing further beyond”) appear across a pair of columns emerging from the water (see Fig. 14). These are the columns that Hercules was thought to have erected at the Straits of Gibraltar, or the end of the known world, as a warning to sailors not to venture into uncharted waters. The columns also figure in at the end of the lecture notes of seventeenth-century philosophy students from the University of Leuven (Fig. 15). Fig. 15. 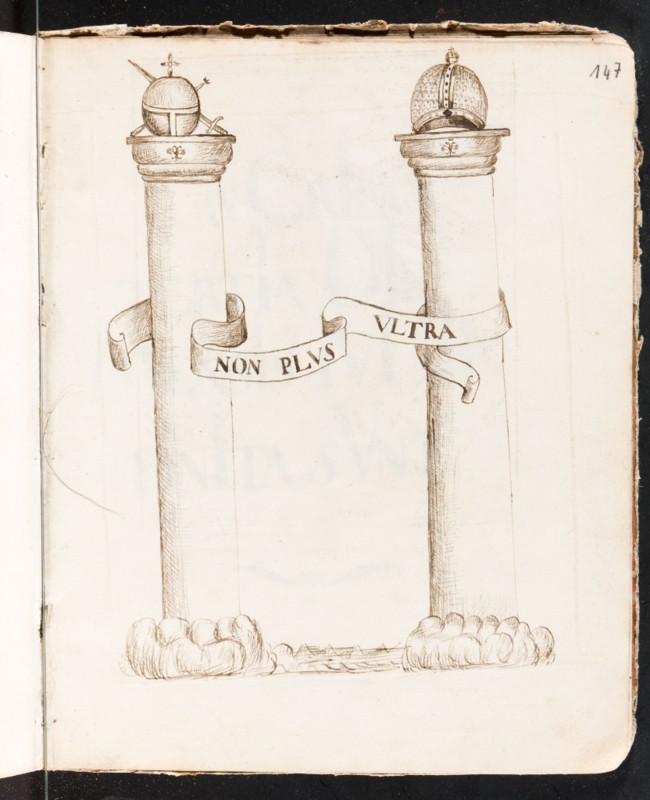 Drawing of the columns of Hercules in the notebook of van Cantelbeke. 7.8 x 6.3 in. (19.8 x 16 cm) KU Leuven [Ms. 205, fol. 147r]. Chéron and Gaultier designed their philosophical image to be read in a generally linear progression that concludes at the top of the page; the columns, at the upper right of the broadside, are depicted at the end of the students’ philosophical journey. Chéron and Gaultier present the columns as markers of the ending of studies of logic. Perhaps even more is implied by these columns: that the doctrine of logic is completed and nothing can be added to it; that whosoever ventures beyond Aristotle will drown. This quotation is a paraphrase of Boethius, Consolatio philosophiae, I.3. Based on THE ART OF PHILOSOPHY: Visual Thinking in Europe from the Late Renaissance to the Early Enlightenment by Susanna Berger. Copyright © 2017 by Princeton University Press.